Never have I been so happy that my job entails sitting on my rump and sending pitches. 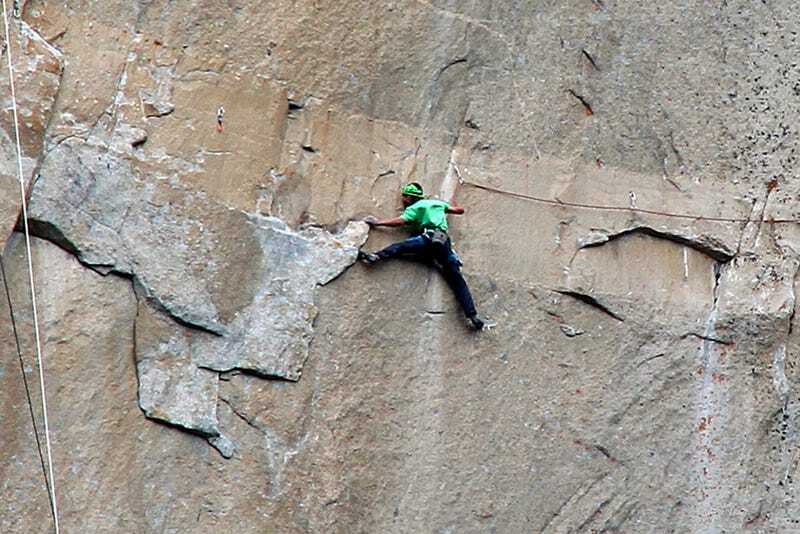 Above, that's Kevin Jorgeson at his office, sending pitches. See the difference? Jorgeson and Tommy Caldwell, below in red, spent seven years planning and 19 days executing a free climb of the Dawn Wall of El Cap in California, considered by far the most difficult climb in the world. Until yesterday, it was considered impossible. So, they pulled themselves 3,000 feet up a sheer granite wall using sticky shoes and mostly just that end part of their fingers, the distal phalanx. Man, that's rugged. Extra credit? See Caldwell's left hand reaching up to grasp/stick onto a slab of granite? He's relying on just three beat up distal phalanges and a thumb there, because in 2001, he severed his index finger at the middle knuckle in a table saw accident. And speaking of pants crapping, can we get a witness for photographer Brett Lowell, in the green jacket, and the unidentified photographer in that crack above and to the right? As terrifying as Caldwell and Jorgeson's exploits were, the photographers, who managed some pretty sweet POVs while dangling from ropes and trying not to scratch their lenses or, you know, cry, deserve a shout. Sure, the lads got all the press and kudos and presidential recognition, but what about the picture takers who have to let go of the rope? Calm your bowels with something bland and binding and then check out their work on Caldwell's and Jorgeson's Instagrams. If that went okay for you, let's ratchet it up a notch. Go to 1:50 in this video. This really explains the whole free climbing thing—see? You only fall 20 or 30 feet. And are spared becoming an irrelevant goopy spot on the canyon floor by the harness around your delicate parts which simultaneously introduces your buttocks to your sternum and your soft, rippable, breakable, yielding flesh to a mountain of granite in one surprising moment. This happened to Jorgeson and Caldwell lots and lots of times between December 27th and January 14th. If the desensitizing-through-exposure program is going well and a change of foundations is at the ready, let's move on. Wait a second... are you clipped in to the standing desk? Safety first.